How do you fill big boots? Moses delivered some 2 million people from slavery. He led them literally right through the Red Sea and away to safety from the advancing Egyptian armies. He helped his people survive in the wilderness for 40 years, introducing a governing structure, laws, and a vision for the future. When many of the children of Israel were failing and even Aaron and Miriam were questioning, Moses stood true and firm and maintained his personal relationship with God. His boots were truly big boots to follow and fill! And so after Moses comes Joshua, the son of Nun. Could you imagine the feeling of insufficiency Joshua must have felt. Even his heritage makes him sound like a nobody! How hard would it be to follow after Moses? How would you feel if you were asked to take over from Moses? Have you ever felt overwhelmed by responsibility? 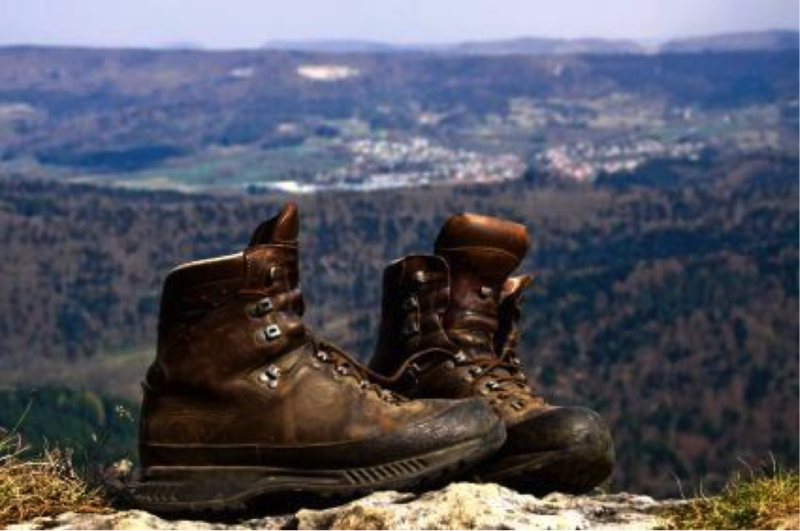 The life of Joshua, teaches an important lesson to those of us who have ever stood in the shadows of giants or taken on a responsibility or challenge. "...as I was with Moses, so I will be with thee: I will not fail thee, nor forsake thee". Read the advice the Lord gives Joshua in Joshua 1:6-9. What particular instruction does the Lord give Joshua three times? "Be strong and of a good courage". Each time he issues that instruction, it is added upon and clarified a little. He will need to be strong and of a good courage in battle (v6), in keeping the commandments (v7-8), and in keeping positive (v.9). If Moses' mission was baptizing the people (via the Red Sea) and teaching them the commandments and repentance (in the wilderness), Joshua's role was to get the people to the temple (the promised land) and keep them worthy of it. make sure you are set apart by one who holds authority. The world is so full of darkness and confusion and noise. If you are a regular early-riser you will know that those early hours of the morning are peaceful, clear and enlightening. I love the symbolism of this story. The worthy priesthood leadership as signified by their tribal affiliation and their chosen status have the ability to bear the ark and lead the way. But they still had to enter the flooded river, if only a little way, they still had to walk forward. We too, no matter what the challenge, must walk forward into the waters edge. It is only when we do so bearing the priesthood righteously with God in our midst that we can see the power of the Lord. Consider the following story. “Shortly after I was called as a General Authority, I went to Elder Harold B. Lee for counsel. He listened very carefully to my problem and suggested that I see President David O. McKay. President McKay counseled me as to the direction I should go. I was very willing to be obedient but saw no way possible for me to do as he counseled me to do. 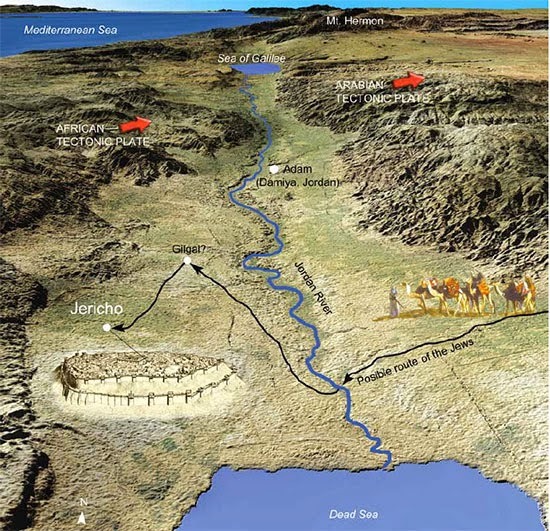 The miracle of the Jordan River reminds us of the parting of the Red Sea. Why did the Lord choose to replicate this miracle at this time? Joshua 4:14 Consider that those that crossed the Jordan had not crossed the Red Sea with Moses unless they were small children. They would have undoubtedly heard the stories but to now experience this same thing that their parents spoke of with reverence must have been a humbling, emotional and powerful experience. I love the words of Joshua in Joshua 4:21-24. What personal memorials do you have in your life that remind you of God's power? Why are these important? For 6 days they were to walk around the city, once each day with their entire armies. Each time, seven priests would walk in front of the ark of the covenant as they circled the city, holding a ram's horn trumpet. On the 7th day they were to walk around the city 7 times with their entire armies and the priests were to make a long blast with their trumpets. 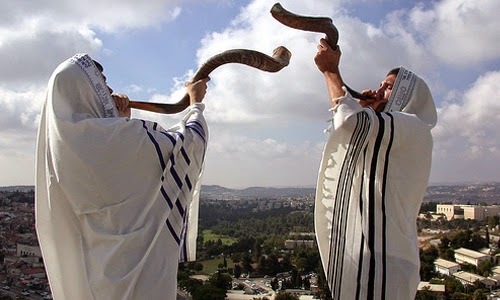 When the people hear the long blast of the trumpets, they are to shout really loudly and then the Lord promises that the city walls would fall down. Joshua 6:12,15 There he is rising early again! Of course the siege of Jericho ended when the people shouted in faith. The walls "came tumbling down" and they utterly defeated the city. Once more Joshua is faithful in following the instructions of the Lord and once more the younger generation of the children of Israel prove faithful in following the instructions passed to them by their new prophet and leader Joshua. 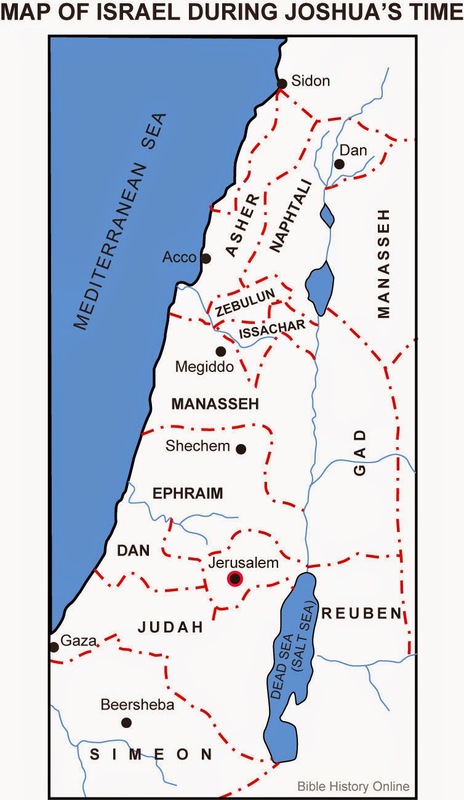 Within a few years and certainly no more than 45 years of crossing the Jordan, the children of Israel had pretty much taken possession of the entire Land of Canaan. It was divided by lots among the tribes of Israel and it was left to the tribes to subjugate the land and remove the Canaanite people from it that were left in the conquered lands. Joshua 23:1-4, 6-7, 11-13 Don't become polluted. Joshua 24:14-15 Choose ye THIS day...why is it important to choose today to follow the Lord? In the middle of Joshua's story we are reminded of his fellow spy, Caleb. Caleb was the other spy who went with Joshua into the promised land, under Moses' instruction. He returned with a favourable report and was blessed for his courage and honesty. When we meet Caleb again, he is now 85 years old. And he is now reminding Joshua of his faithfulness and the Lord's promise and is claiming his righteous inheritance in Joshua 14:11-12 I wonder how many of us will be able to confidently claim our inheritance in the promised land as did Caleb. What gave Caleb his confidence to make such a bold claim of the Lord? see v. 8,9,14. He "wholly followed" the Lord. “From Caleb’s example we learn very important lessons. Just as Caleb had to struggle and remain true and faithful to gain his inheritance, so we must remember that, while the Lord has promised us a place in his kingdom, we must ever strive constantly and faithfully so as to be worthy to receive the reward. “Caleb concluded his moving declaration with a request and a challenge with which my heart finds full sympathy. The Anakims, the giants, were still inhabiting the promised land, and they had to be overcome. Said Caleb, now at 85 years, ‘Give me this mountain’ (Joshua 14:12). May we follow the example of Caleb and Joshua and always be ready to face the "giant" challenges and take on the responsibilities the Lord requires of us is my prayer.